Bright Activity Rings appeal to children of all ages – as well as grown-ups. 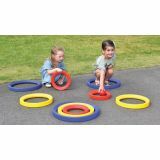 Activity rings inspire countless activities like balancing rings on head, juggling rings on arms and legs, throwing rings teach other, and so forth. 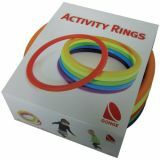 Activity Rings invites spontaneous play as well as structured activities including games, music/dancing, and physical education. Activity Rings allow individual as well as social activities. Made from artificial rubber (TPE). Allow players to shoot from all sides! Goals are portable, lightweight, and assemble in minutes. 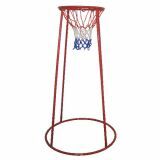 This sturdy, tubular steel goal has 36" base and 18" hoop. 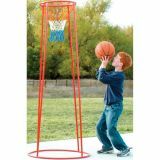 Large 6' shooting goal can be used as a 4' goal, or with included extenders, as a 6' goal. A safe alternative to traditional wooden croquet that provides a game of fun and accuracy for the whole family! The set includes six 28” mallets, six balls, nine weighted foam covered wickets, and two stakes. The set comes packed in a handy carrying case for easy storage and transport. 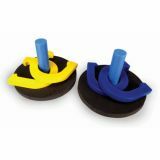 Soft and safe foam horseshoe set has a spongy core and adorable tuff-coat skin for years of reliable use. Set includes four colored horseshoes, two stake mats and two stakes pegs. Great for all ages. Set of 9 high quality giant rings in 3 sizes. Roll them, sort them by color and size or use for sorting. 12 months+. The ECR4Kids 4-To-Score is a life-sized version of the classic strategy ring-dropping game. 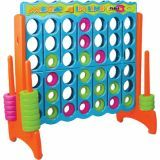 Made of brightly colored durable plastic, children will learn cooperation and teamwork as they try to connect four colored rings in a row before their opponent. While great for 2 players, 4-To-Score can also be used for championship matches with teams. Weather and fade resistant for use indoors or outdoors. 48"W x 22 1/2"D x 46"H. Additional shipping charges apply. A life-sized version of the classic, strategy ring-dropping game! 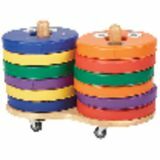 Made of brightly colored durable plastic, children will learn cooperation and teamwork as they try to connect four colored rings in a row before their opponent. Weather and fade resistant for use indoors or outdoors. For 2 players or teams. The ECR4Kids 4-To-Score is a life-sized version of the classic strategy ring-dropping game. 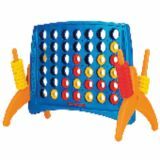 Made of brightly colored durable plastic, children will learn cooperation and teamwork as they try to connect four colored rings in a row before their opponent. While great for 2 players, 4-To-Score can also be used for championship matches with teams. Weather and fade resistant for use indoors or outdoors. 46 1/4"W x 24"D x 34 1/2"H. Additional shipping charges apply. Colorful 24" putter features a durable plastic shaft and head and foam grip. 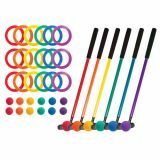 Set includes 6 putters, 18 targets and 18 solid foam balls in rainbow colors. 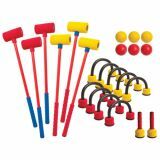 The Champion Sports Bowling Set is fun for everyone to bowl safely indoors or outdoors. 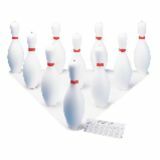 This set includes a 5lb lightweight rubber bowling ball, ten weighted plastic bowling pins, a set up sheet, and score pad. Create your own bowling alley anywhere! Play indoors or out with this plastic bowling set. 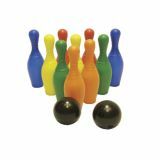 Set includes 10 colorful pins, 2 bowling balls, and a yellow carrying bag with handle.